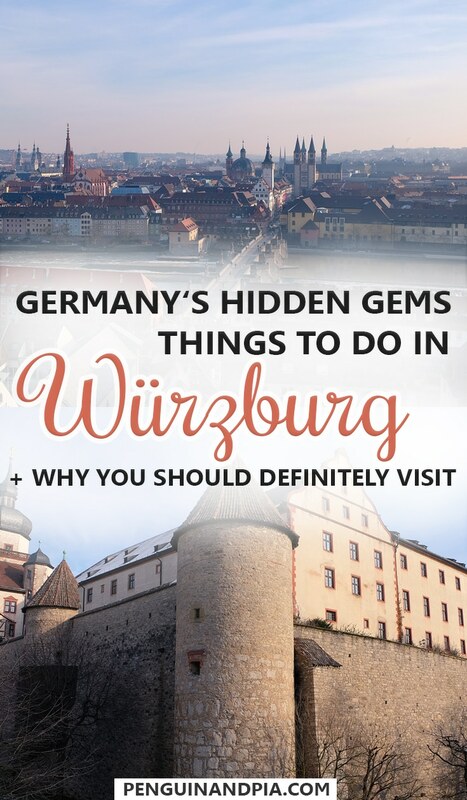 Let’s Explore Some Great Things to Do in Würzburg! 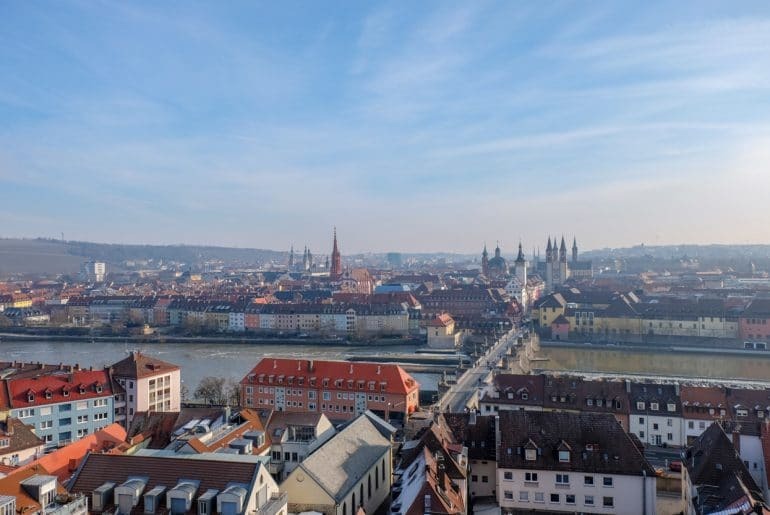 Is Würzburg worth visiting? 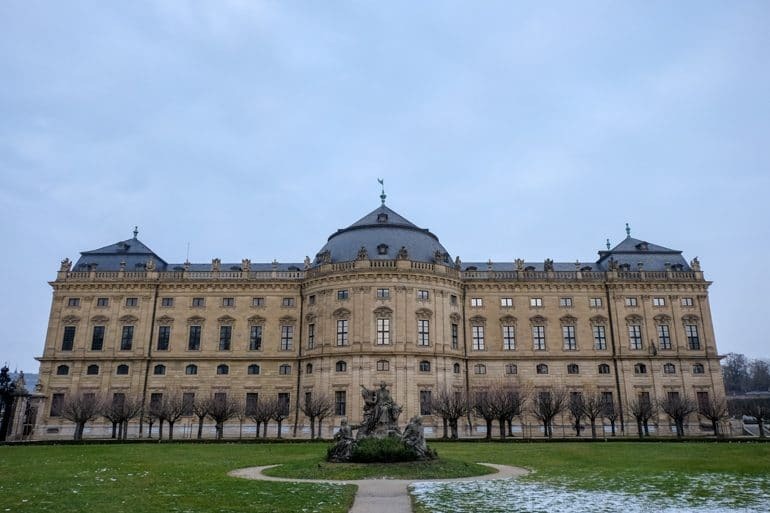 Since there are so many things to do in Würzburg – we think so! This beautiful little town boasts some of the grandest buildings in Germany – from the famous Würzburg Residence to the Würzburg Town Hall. There’s a reason it’s on our list of favourite wintertime cities in Europe! Spend A Day in Coburg, in Aachen, or in Bamberg! Just a Day Trip from Frankfurt: Wiesbaden and Mainz Are Calling! Explore the Amazing Capital City – Berlin! It’s important to note that Germans write Würzburg with an ‘ü’ but in English it is also frequently written with a ‘u’. Confused? You might need to brush up on your German phrases! Also important to note – lots of travellers might find it difficult to find Würzburg on Germany map! 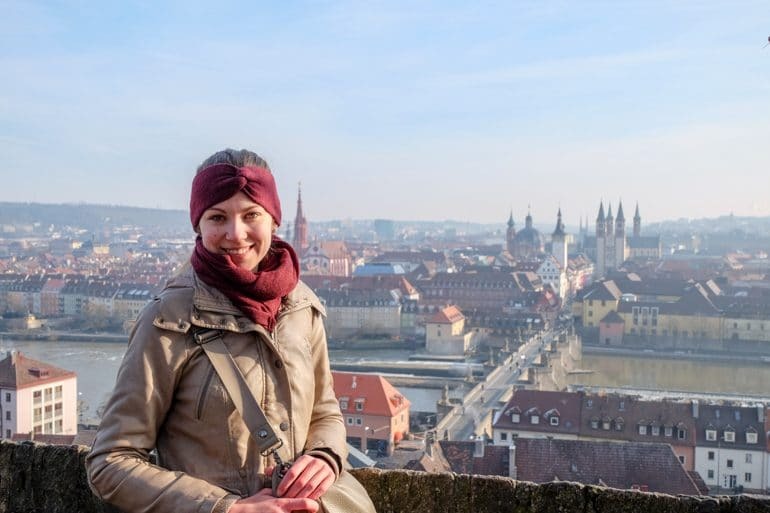 Let’s dive into learning about Würzburg, and why it should be on your destination list if you’re travelling to Germany for the first time! Great question! Würzburg is in the northern part of Bavaria, a region called Lower Franconia. The area is also globally known as a wine region so if you like wine – Würzburg is for you! Würzburg has located roughly 1.5 hours southeast from Frankfurt am Main, about 3 hours northwest of Munich, and about 4.5 hours southwest of Berlin. See More Germany – Beautiful German Places Suggested by German Bloggers! The views from the Fortress are amazing! Even though Würzburg is not a huge city, it is well connected with the national train and bus system. 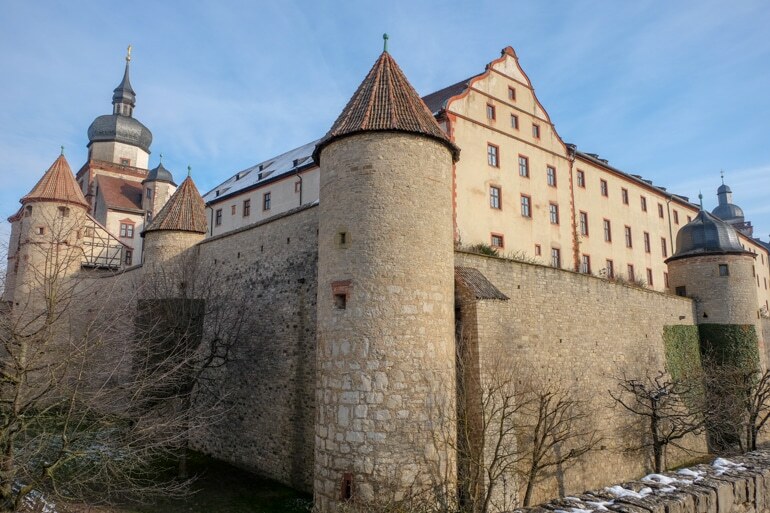 If you had a chance to read our post about Coburg – we can say that it is easier to get to Würzburg than it is to Coburg (one reason being the border that formerly separated East and West Germany many years ago). It’s easy to get to Würzburg by train as it is very well connected. Most of the time, you’ll find a direct connection or connections with only one change. If you’re travelling from the north you’ll likely go through Frankfurt and then head to Würzburg. There are a lot of trains between these two cities everyday, so you shouldn’t have any trouble finding a suitable connection. Again, if you take an ICE (the fast, but more expensive train) the journey will take approximately one hour. If you’re travelling from the South (Munich) it should be easy to get to Würzburg with a direct connection. If you take an ICE, the journey should take around 2 hours. As we have mentioned, getting around by train is pretty easy in Germany. You can find a train connection and book your ticket here at the Deutsche Bahn Website. If you decide to travel on the faster ICE trains we would recommend booking your ticket as far in advance as possible since they can get pretty expensive otherwise. 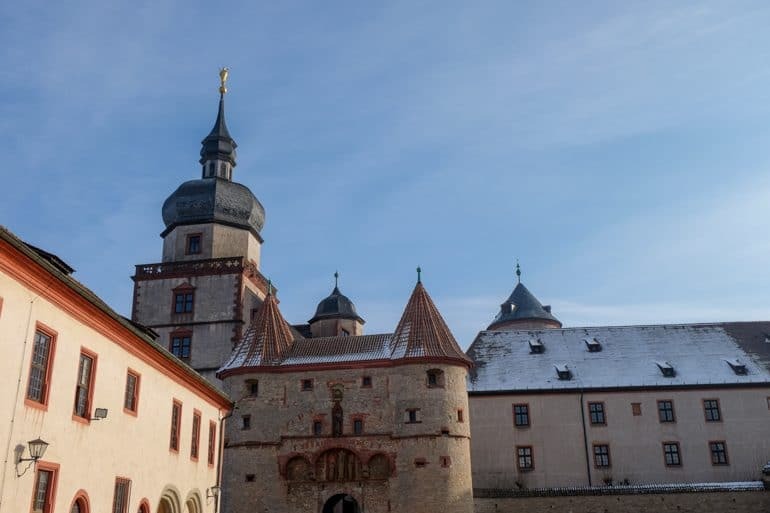 Helpful Local German Tip: If you are travelling to Würzburg from another city in Bavaria (or even more specifically Franconia) look into getting a Bayern Ticket or Franken-Thüringen Ticket – especially if you are travelling with other people. Generally, it can be cheaper. You could also take a Flixbus to Würzburg. There are direct connections from Munich as well as buses from Frankfurt and many other German cities. The bus is usually cheaper than the train (depending on where you are coming), but it can also take slightly longer. You can check the Flixbus Website to see if there is a route that works for you. Eric legitimately wandering through history. Würzburg has a very long history – dating back to the 4th century when it was settled by the Alamanni (Germanic tribes). Originally, it was Christianized by Irish missionaries in 686. Saint Boniface was appointed the first Bishop of Würzburg in 742 and over time created a duchy (fancy territory) which extended to eastern Franconia (Würzburg was at the centre of it). The first church in Würzburg – the Würzburg Cathedral – was first built in 788. The current building, however, is from the 13th century. Würzburg also has a very old university dating back to the 15th century. Witch trials occurred in the 17th century in which between 600 – 900 “witches” were burnt. Over the following couple centuries there have been many battles and, as a result of who won each one, the city was part of different “electorates”. In 1814, it became part of the Kingdom of Bavaria. During the second world war, 90% of the city was destroyed within 17 minutes – including the churches, cathedrals, and medieval city centre (it was reconstructed over the next 20 years). Würzburg doesn’t have a ton of cheap accommodation options but there are lots of great hotels if you have the money to spend. We’ve included the hostel we stayed at below, as well as one option for a cheaper but well-rated hotel in the city. We stayed at Hostel Babelfish when we spent a night in Würzburg and couldn’t stay with a friend. The hostel is opposite the train station and it’s easy to walk to the centre from there. The place has an authentic backpacker/traveller feel to it which is great for meeting people and being social. We actually wrote about it as one of our favourite hostels in Germany! Since we were just passing through and wanted cheap accommodation to try and get some work done, we booked a private room. It ended up being basically an apartment with its own kitchen and terrace – too bad it was wintertime! They have other nice private rooms which cost approx. 70 Euro a night. If you want to book a stay, check here for the latest prices at Hostel Babelfish. Located in the centre of Würzburg close to the train station, the banks of the River Main, and a short walk to all the best attractions, Hotel Strauss is the perfect place to use as a base for your Würzburg adventure. There’s even a tram stop right across the street from the hotel which makes getting to and from a breeze! The rooms have modern furniture, ensuite bathrooms, and all the amenities you’d be looking for. Onsite, there’s a delicious restaurant where you can try Franconian wine and/or local Würzburger beer from the area. Check the latest prices at Hotel Strauss for your trip to Würzburg! Würzburg is great because there’s a calming, leisurely pace about the city. You lose the hustle and bustle while you’re there and get a chance to take in the cobblestone streets, old street trams chugging along, and aged architecture. Since there are lots of things to do and see, we will mention the things you should do when you’re only in the city for a short amount of time. The Fortress is really stunning from the inside and out. Walking up to the Fortress (colloquially often called Marienfestung) is a MUST. You’ll get an incredible view of the city – particularly the old town with the Alte Mainbrücke (famous bridge). From the 13th century until when the Residenz was finished (see below), the Fortress was the seat of the Prince-bishops. For more great views of the city and the surrounding wine country, you can easily take a stroll around the outer wall. If you’re feeling up to it, you can also tour some parts of the fortress such as the Princes’ Hall and the Treasury, among other places. The Mainfränkisches Museum can be found within the fortress and it houses a Baroque armory collection dating back to 1712. The Residence is a massive, elegant building that you should check out. Built between 1719-44, it is considered one of the most beautiful secular baroque buildings in the country. You can go inside and take a tour. Additionally, you can also visit the Martin von Wagner Museum in the south wing which has a big selection of art and antiques. Lisa being warm and also kind of symmetrical in the Gardens. Don’t forget to walk the gardens while you’re touring the Residence! This was one of our favourite activities in Würzburg. In the summer, there are beautiful flowers and you just have to appreciate the precision and symmetry of the grounds. Trust us, these areas also make for great photo opportunities! 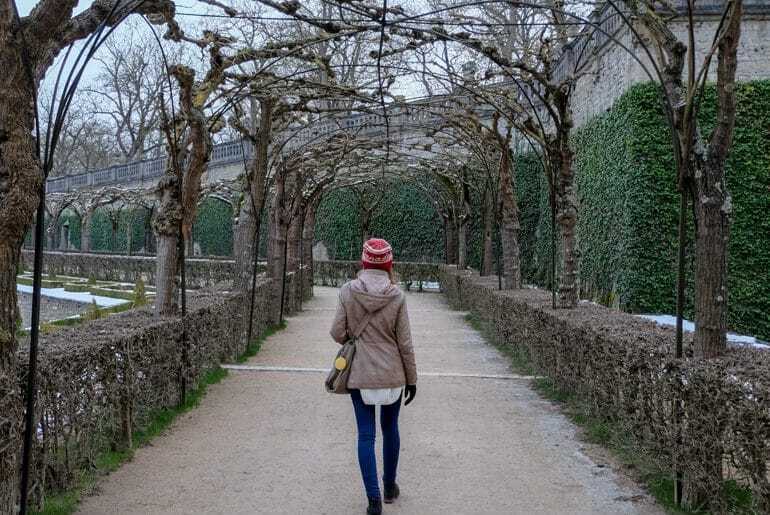 The gardens were built around the same time as the Residenz and are considered to be one of the best-preserved Rococo garden in Germany (hence the incredible symmetry). You can find sculptures and fountains in there but there are also benches to sit down and take a rest if you’re so excited by all the symmetrical photo-taking. One of the most classic of activities is to have a beverage on the old Main bridge (Alte Mainbrücke in German). 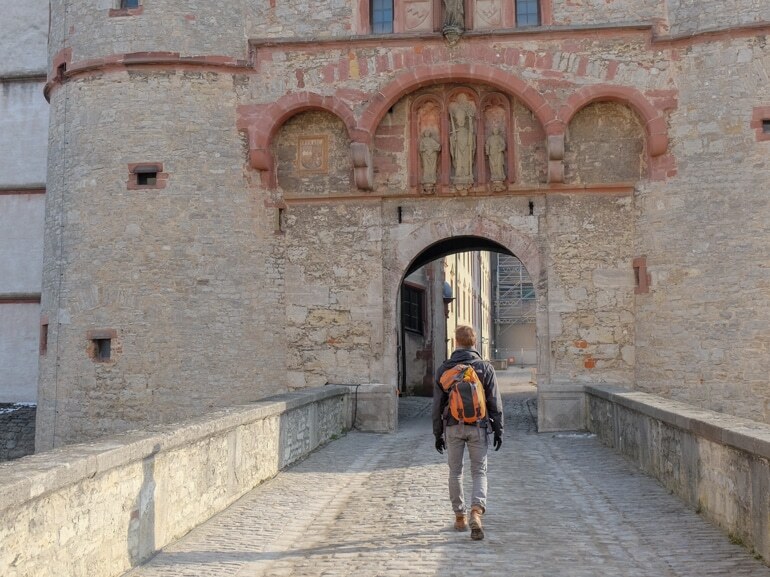 You’ll cross the bridge if you follow our advice and head from the old town to the Fortress. From spring to fall (and even on nice winter days), the bridge is lined with people – many of them enjoying a glass of wine. This seems to have become a tradition for locals and visitors alike – so join them for a glass. Believe us, it is a great experience – we’ve tried it before. On the bridge itself, you’ll also find numerous statues of saints – showing the huge role that religion played in the city in the past (and to some degree still to this date)! Würzburg Cathedral is the building to the far right of Lisa with the four pointy towers. As mentioned in the history section, the Würzburg cathedral (or Würzburger Dom, as it is called in German) was the first church built in the city – back in 788. However, the building you can see today is from the 13th century. It is dedicated to St. Kilian and it’s actually one of Germany’s largest Romanesque churches. If you are interested you can also see different works of art in the cathedral. As you might now, the river running through the city is called Main. You can enjoy a walk along the side of the fortress (a popular past-time among the locals). You can even grab a snack or something to drink and have a small picnic. Seriously though, did you see that Fortress? Würzburg is a student town so there are lots of great cafés and restaurants around. Whether you’re looking for delicious coffee and cakes or want a hearty Bavarian meal – Würzburg has lots of great options. We list some of our favourites below, but feel free to do your own research if these don’t spark your fancy. When you’re in Würzburg you absolutely have to go here. The cafe is insanely popular with the younger crowd – and understandably so because it is that delicious. Wunschlos has to be Lisa’s favourite cafe in Würzburg and she’s brought friends there numerous times. It’s actually hidden in a back alley and you would never find it if you didn’t know about it and weren’t looking for it! It’s usually always busy so be early if you’re heading for brunch. You might have to wait a few minutes but it is worth it. If you’re not into waiting, to make sure that you’ll get a spot just call in advance. Wunschlos offers delicious breakfasts, cakes, and sweet and savory snacks including waffles, pancakes, and paninis. There are also lots of vegetarian and vegan options if you’re looking! You can have a look at the website and the menu here. Schonborn is both a café and bistro offering great breakfasts, coffees, pastries, and simple dinner dishes such as pizza, Flammkuchen, and pasta. We met a close friend there for dinner and really enjoyed it – as a typical choice for university students, the food is good AND not very expensive. The cafe is great as it is right in the centre of the old town. It’s two floors and has huge windows so it also works great for people watching. We think of it as the perfect stop to grab a coffee or snack after visiting the cathedral since it is so close by. You can check out the full menu here. 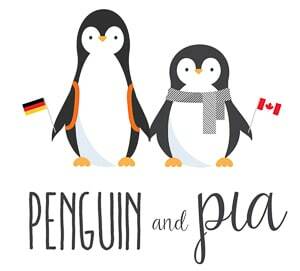 Unfortunately, the menu link is in German only – but you’ll be able to understand some of it and get a general idea of the place. Lisa can recommend the Flammkuchen with mushrooms, by the way! If you want traditional Franconian food in an authentic restaurant, then you have to try Backöfele. It’s also located in the centre of the city which makes it very easy to reach. It’s the perfect location if you want to try Beef Roulade, Franconian Liver Dumpling Soup, or a typical Bavarian Brotzeit. oh, and you should absolutely try the Kaiserschmarrn for dessert – it has to be one of Eric’s favorite dessert dishes. Check out the menu here and select the English Menu. If you are looking for a healthy, but plentiful lunch or early dinner (they close at 8 pm) then you should head to Veggie Bros. Even if you are not vegetarian, you’re likely to enjoy the food. Veggie Bros is perfect if you enjoy Falafel (which Lisa loves – so next time we are in Würzburg we’ll have to stop by). It is quite small so sometimes you might have to wait a couple of minutes until you get a table, but it is a great lunch option right in the city centre. You can have a look at the menu and the delicious looking photos here. 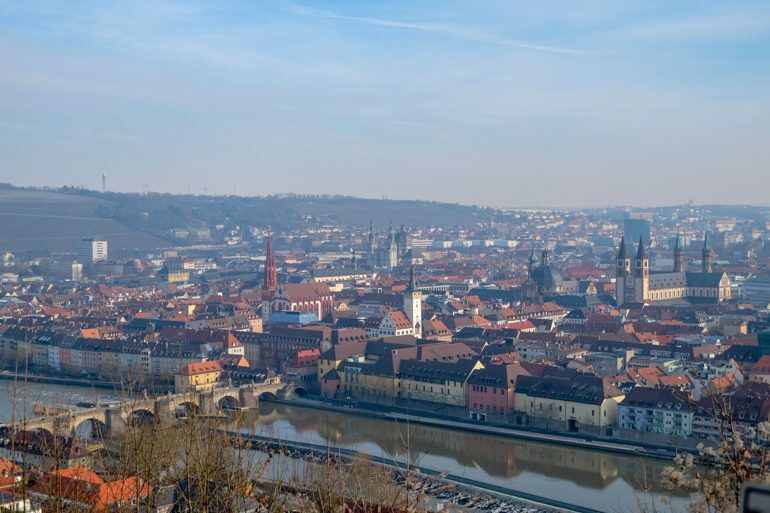 And there you have it – our rundown of Würzburg! We really love the city because, as we’ve mentioned, it’s a great change of pace compared to the bigger centres in Germany. You can be sure that we’ll be back again real soon – Eric hasn’t had “bridge wine” yet and he really wants to have bridge wine! Lisa has so we have to return so we can drink together.